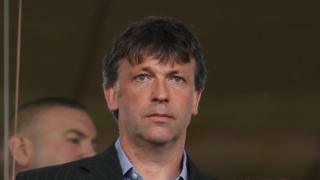 Former Blackpool FC chairman Karl Oyston is suing the club - owned by his father Owen - in a dispute over wages. Mr Oyston's case is due for a two-day hearing at an Employment Tribunal in Manchester. Karl Oyston was replaced by his sister Natalie Christopher as chairman and director of the club in February 2018. Last week the club was put into receivership by the High Court, in a dispute between Owen Oyston and ex-director Valeri Belokon. Karl Oyston had been chairman of the League One club since 1999. The Employment Tribunal would not give detailed information about the case but confirmed it related to wages. Karl Oyston has previously sued Blackpool fans for libel, but also had to apologise to one supporter over an abusive text. A large section of the club's fans have boycotted games for five years over the way Mr Oyston and his father have run the club. The club was put into receivership on 13 February, forcing Owen Oyston to pay former director Belokon £25m. David Rubin & Partners are due to be confirmed as receivers of Blackpool this week in a move which could see Owen Oyston lose control of it. The English Football League said on Monday it would work with the newly-appointed receivers of Blackpool to ensure the club fulfils its fixtures this season. The EFL must also decide whether to dock the Tangerines 12 points - the league's penalty for going into administration - at a meeting on 6 March.